Product configurations used for various membrane types include filter cartridges, bag filters, hollow-fiber membrane modules and spiral-wound membrane elements. Membranes with larger pore sizes typically have a direct flow path through the pores of the membrane, whereas nanofiltration and RO membranes typically operate in crossflow mode with a reject or waste stream that carries contaminants away from the membrane to a waste stream. Some direct flow-path systems use a backwashing or other alternate flow mode to clear accumulated contaminants from the membrane surface and out of the system to extend module life. 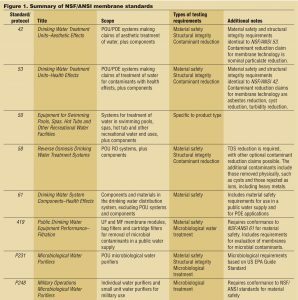 The landscape of NSF/ANSI standards and protocols relative to membrane products used for water treatment can be a bit complicated to navigate. The reasons for this challenging application of the standards are that many are based on the end use as opposed to specifically on the technology and the standards have varying scopes. 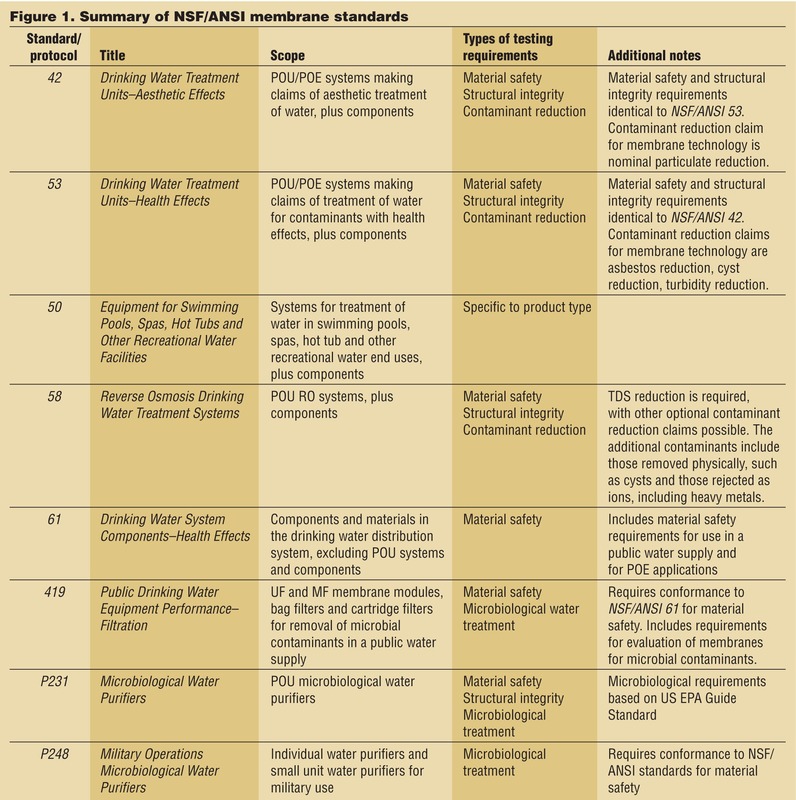 Figure 1 provides a summary of the NSF/ANSI standards relevant to membrane technologies and membrane systems used to provide water treatment. Also included are two important protocols that are not NSF/ANSI standards but are quite relevant. Figure 1 provides the title of each standard, its scope and a brief description of the types of requirements included. Some additional notes are pertinent to having an appreciation and understanding of these standards and how they relate to each other and to membrane technologies. Almost all of the drinking water-related standards require an evaluation for material safety. 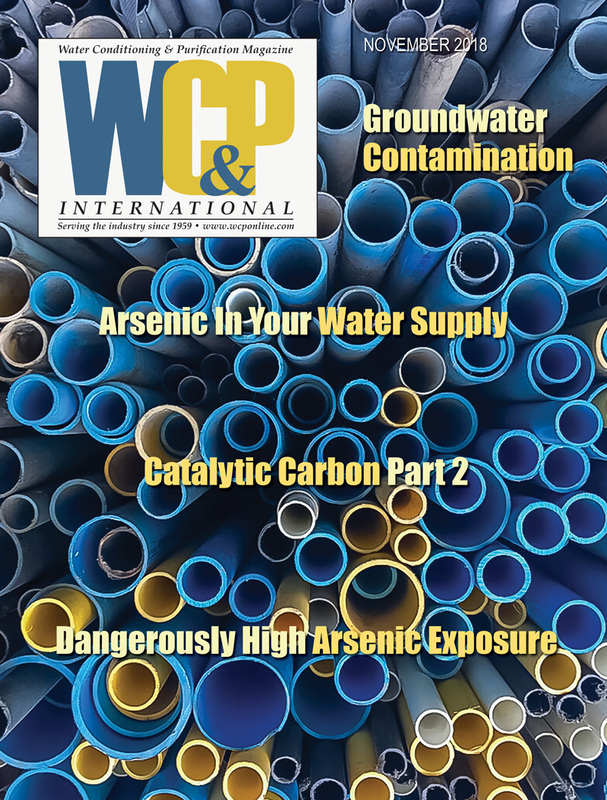 It is an underlying theme of all of the NSF/ANSI drinking water standards and protocols that all materials in contact with drinking water must have a material safety evaluation. This is accomplished through a review of each of the materials to determine what contaminants may leach out of them based on the ingredients, impurities, processing aids and other chemicals associated with each material. This review establishes the analytical parameters for the extraction testing. Extraction testing is accomplished through a variety of specific test methods, depending on the end use of the product, product type and the standard. In each case, sophisticated instrumental analytical techniques, such as gas chromatography/mass spectroscopy (GC/MS) and inductively coupled plasma/mass spectroscopy (ICP/MS), are included to achieve low levels of detection and accurate identification for a large number of potential contaminants. 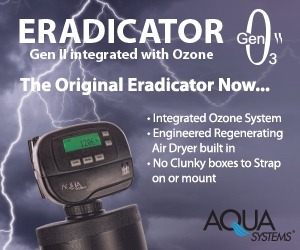 The results of extraction tests are typically adjusted through a mathematical normalization based on the amount of water flowing through the product based on where and how it is used in the distribution system. Finally, an assessment of the potential toxicity of any detected contaminants and their concentrations is conducted to make a determination of pass or fail for the test. Because membranes are used to reduce contaminants in the water, many of these standards include criteria and test methods for contaminant reduction. The types of contaminants evaluated under each standard depend on the technology and its capabilities, plus the end use being evaluated. For example, NSF/ANSI 58 includes, among others, test methods for evaluation of reduction of heavy metal ions in drinking water, whereas NSF/ANSI 419 is focused on microbiological treatment. The microbiological treatment test methods in these standards typically involve the use of actual microorganisms, either the actual microorganisms ultimately being treated in the field (such as Cryptosporidium) or surrogate organisms useful in a laboratory environment and serving as conservative representatives of the actual microorganisms being treated in the field. In some cases, particles such as polystyrene microspheres are used. The test operation of these varies considerably to achieve repeatable and reproducible tests that provide conservative evaluations, providing end users with confidence of performance in real-world conditions. For example, NSF/ANSI 58 requires a seven-day test operation with a variety of usage patterns incorporated into the test, such as partial storage-tank draws, complete storage-tanks draws and a stagnation period. 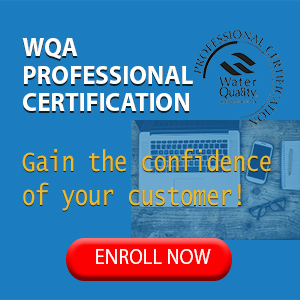 Each of the standards mentioned here includes significant details related to requirements, test methods, acceptance criteria and more. It is possible to dive very deeply into each one of them and explore some very interesting aspects of each. 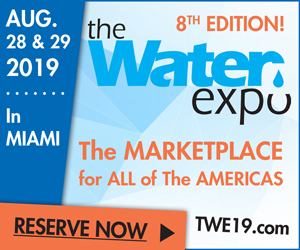 These deep dives can be very useful and informative, but they do not necessarily reveal a broad look at the entire landscape of standards applicable to various types of membrane technologies, end uses and product configurations. Hopefully the information presented here helps provide a basic overview to help piece together the high-level structure and relationships of these standards to the membrane technologies and to each other.